Are There Dangers of Liquid Stevia? Licorice root and licorice root extract flavor foods and might help to treat health conditions including heartburn, canker sores, peptic ulcers and upper respiratory infections. Some women also consume licorice in the hopes of inducing labor, but there isn't sufficient evidence for the effectiveness of licorice for any of these purposes, according to the National Center for Complementary and Alternative Medicine. Licorice root and licorice extract contain an ingredient called glycyrrhizin, which might have either an estrogen-like or an anti-estrogen effect. It might cause uterine contractions, so consuming large amounts of licorice root or licorice that contains licorice extract might bring on labor in some women, but it also could have dangerous side effects and not bring on labor, so it isn't a good idea to intentionally consume large amounts of this substance during pregnancy. 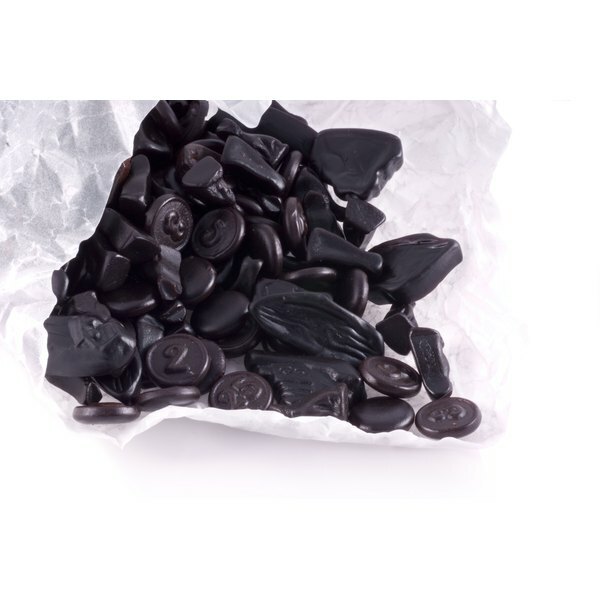 Not all black licorice candy contains licorice extract. Many licorice candies are flavored with anise rather than licorice extract. These candies would not induce labor. Small amounts of black licorice candy made with licorice extract also are unlikely to induce labor, according to eMedTV, but large amounts might and so are not advised during pregnancy. Large amounts of licorice can cause side effects that are particularly dangerous during pregnancy, including low levels of potassium in your blood, high blood pressure, paralysis and brain damage. These side effects are more likely to occur if you have heart disease, kidney disease or high blood pressure, or take more than 30 g of licorice each day for a few weeks. It also might interact with medications, including diuretics, corticosteroids, blood thinners, blood pressure medications, furosemide, digoxin, estrogens, ACE inhibitors, MAO inhibitors, laxatives, diabetes medication and ethacrynic acid. Don't consume black licorice in large amounts during pregnancy without speaking with your doctor. Black licorice isn't guaranteed to induce labor and could cause dangerous side effects if it contains glycyrrhizin. Follow the advice of your doctor regarding safe methods to induce labor rather than attempting to do this on your own.